This recent confusion over saturated fat may be a result of people trying to blame carbs for the nation’s weight problems—even though the country’s grain intake is actually far lower than what it once was. What hasn’t gone down is the nation’s meat and cheese intake. In fact, it has done just the opposite. In 1909, Americans ate 123.9 pounds of meat per person per year. Since then, meat intake has soared to more than 200 pounds per person per year, and cheese intake has risen from less than 4 pounds to nearly 34 pounds per year. We have known for decades that fatty foods are anything but good for you, but recent media reports glorifying saturated have caused confusion. Do not be fooled. There is nothing healthful about butter, bacon, cheese, or steak. Saturated fat poses numerous severe health risks of which everyone should be aware. This recent confusion over saturated fat may be a result of people trying to blame carbs for the nation’s weight problems—even though the country’s grain intake is actually far lower than what it once was. What hasn’t gone down is the nation’s meat and cheese intake. In fact, it has done just the opposite. In 1909, Americans ate 123.9 pounds of meat per person per year. Since then, meat intake has soared to more than 200 pounds per person per year, and cheese intake has risen from less than 4 pounds to nearly 34 pounds per year. 1. Saturated fat can DOUBLE the risk of Alzheimer’s disease. Increased saturated fat intake is associated with increased risk for Alzheimer’s disease, dementia, and cognitive decline. In the Chicago Health and Aging Project, people who ate the most saturated fat had twice the risk of developing Alzheimer’s disease after four years, compared with those who ate the least saturated fat. The Washington Heights-Inwood Columbia Aging Project in New York and the Cardiovascular Risk Factors, Aging, and Dementia study in Finland also link Alzheimer’s disease risk with saturated fat intake. 2. Saturated fat increases cholesterol levels AND heart disease risk. Research finds that increased saturated fat intake increases the risk of developing heart disease. Consumers are often pushed to eat fatty foods with the false claim that one unhealthful meal can’t hurt you. 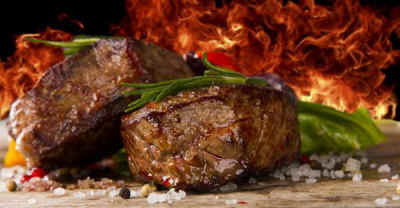 But research shows that eating just one high-fat meal can raise the risk of having a heart attack the same day. Diets high in saturated fat are associated with type 2 diabetes. Harvard researchers found that total fat intake and saturated fat intake were associated with a greater risk of diabetes. In the same study, they found that eating bacon, hot dogs, or other processed meats—all high in saturated fat—five or more times per week increases a man’s risk of developing type 2 diabetes by nearly 50 percent. Diets high in saturated fat also increase insulin resistance. 4. Saturated fat is associated with MULTIPLE cancers. Barnard ND, Bunner AE, Agarwal U. Saturated and trans fats and dementia: a systematic review. Neurobiol Aging. 2014;35:S65-S73. Morris MC, Evans DA, Bienias JL, et al. Dietary fats and the risk of incident Alzheimer’s disease. Arch Neurol. 2003;60:194-200. Laitinen MH, Ngandu T, Rovio S, et al. Fat intake at midlife and risk of dementia and Alzheimer’s disease: a population-based study. Dement Geriatr Cogn Disord. 2006;22: 99-107. Luchsinger JA, Tang MX, Shea S, Mayeux R. Caloric intake and the risk of Alzheimer’s disease. Arch Neurol. 2002;59:1258-1263. Beydoun MA, Kaufman JS, Satia JA, Rosamond W, Folsom AR. Plasma n-3 fatty acids and the risk of cognitive decline in older adults: the Atherosclerosis Risk in Communities Study. Am J Clin Nutr. 2007;85:1103-1111. Devore EE, Goldstein F, van Rooij FJ, et al. Dietary antioxidants and long-term risk of dementia. Arch Neurol. 2010;67:819-825. Eskelinen MH, Ngandu T, Helkala EL, et al. Fat intake at midlife and cognitive impairment later in life: a population-based CAIDE study. Int J Geriatr Psychiatry. 2008;23:741-747. Heude B, Ducimetière P, Berr C. Cognitive decline and fatty acid composition of erythrocyte membranes—the EVA Study. Am J Clin Nutr. 2003;77:803-808. Morris MC, Evans DA, Tangney CC, et al. Dietary copper and high saturated and trans fat intakes associated with cognitive decline. Arch Neurol. 2006;63:1085-1088. Okereke OI, Rosner BA, Kim DH, et al. Dietary fat types and 4-year cognitive change in community-dwelling older women. Ann Neurol. 2012;72:124-134. Mann JI. Diet and risk of coronary heart disease and type 2 diabetes. Lancet. 2002;360: 783-789. Mahendran Y, Cederberg H, Vangipurapu J, et al. Glycerol and fatty acids in serum predict the development of hyperglycemia and type 2 diabetes in Finnish men. Diabetes Care. 2013;36:3732-3738. Mann JI. Diet and risk of coronary heart disease and type 2 diabetes. Lancet. 2002; 360: 783-789. Van Dam RM, Willett WC, Rimm EB, Stampfer MJ, Hu FB. Dietary fat and meat intake in relation to risk of Type 2 diabetes in men. Diabetes Care. 2002;25:417-424. Oranta O, Pahkala K, Ruottinen S, et al. Infancy-onset dietary counseling of low-saturated-fat diet improves insulin sensitivity in healthy adolescents 15-20 years of age: the Special Turku Coronary Risk Factor Intervention Project (STRIP) study. Diabetes Care. 2013;36:2952-2959. Farvid MS, Cho E, Chen WY, Eliassen AH, Willett WC. Premenopausal dietary fat in relation to pre- and post-menopausal breast cancer. Breast Cancer Res Treat. 2014;145:255-265. Strom SS, Yamamura Y, Forman MR, Pettaway CA, Barrera SL, DiGiovanni J. Saturated fat intake predicts biochemical failure after prostatectomy. Int J Cancer. 2008;122:2581-2585. Tabung FK, Steck SE, Zhang J. Dietary inflammatory index and risk of mortality: findings from the Aerobics Center Longitudinal Study. Poster presented at: American Institute for Cancer Research (AICR) Annual Research Conference; November 7, 2013: Bethesda, MD.